Woohoo! I am a winner! Can you believe it? I never win anything but I won something very special yesterday! It was a Golden Ticket to go to the Stampin' Up Convention for European demonstrators! I've known about this event for a long time but put it to the back of mind knowing there was no way I'd be able to go but now...! I'm so excited! This is a one sheet wonder - meaning that I stamped the design over an A4 sheet of card stock and cut it up to make lots of cards. I used the sweet Christmas set Hung Up on the Holidays which is being retired this year. I love this set and have found it to be quite a hard worker! That star, for example, has seen plenty of action all through the year and there is also a useful little 'hanging thread' image in the set. It is available, along with all the other items on the Last Chance List, until the 30th September! Do check the Last Chance List here for last minute bargains and click here to email me your order. If you're finding it difficult to work out the Last Chance List, give me a call on 01280 820593 and I'll be happy to help you. Stamp an A4 piece of Whisper White card with a random design. Cut off a 6.5cm x9cm piece. Take a piece of Pink Passion card stock 14cm x 7cm and scallop the bottom with the scallop border punch. Mount the stamped panel onto this. 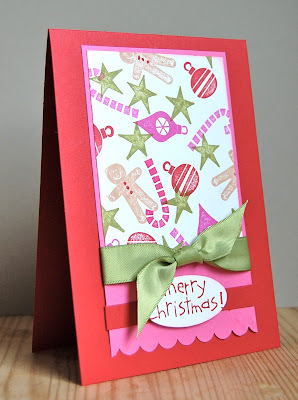 Cut a 1cm strip of Real Red card stock and wrap it around the Pink Passion card stock. Stamp a sentiment onto a scrap of Whisper White, cut it out with the Oval punch and attach it to the strip using dimensionals. Knot a piece of satin ribbon round the bottom of the stamped panel, above the sentiment, and mount onto a Real Red card blank. I do realise that I seem to be posting lots of Christmas cards when it's only September! But it's perfect weather for making them and if you start now, you'll have one less thing to do when it comes round to December! And talking of saving time - it's Three Minute Thursday here tomorrow! 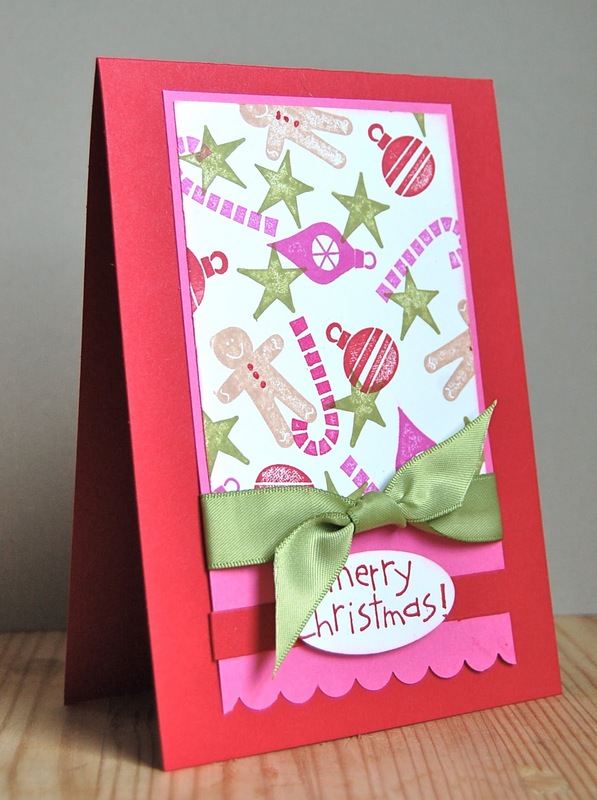 Don't forget to pop in and see the speedy card I'll be making then. Congratulations!!! Isn`t it great to win something? And... that was not a witter, we need to know more. Where? When? Oh, and your card is brilliant btw. Wow Wow Wow!! How fabulous for you and how EXCITING!! Looking forward to hearing LOTS MORE "witters" (Is that an English term? I had never heard of that before Lol!!) Oh and I LOVE you OSW too- you make me want so many sets I never had interest in before! How fun that you made your own colorful holiday paper. Cute card. And super fun that you get to go to the SU convention.